Growing up, one of the challenges I faced in my education was staying engaged in my classes. I have always enjoyed learning and I wanted to learn, but I was stuck with teachers that did the minimum amount possible. This made it really challenging for me to stay focused in class and left me without the ability to care. If we want our students to truly learn, how can we keep them engaged? Engagement is such a muddy term that can mean a lot of things, but ultimately engagement means that our students care about their learning and participate the best they can. How can we keep our students engaged? How can we get our students to care about their learning? My answer is informal learning. My earliest experiences learning about science came from the science and natural history museums my mom took me to as a child. My mom was heavily invested in my education and did what she could to boost my learning. There were two museums in particular we visited all the time. One was a natural history museum filled with fossils, which was always entertaining. The one I loved the most, of course, was the science museum. The most fun I had learning about science was at the science museum in my hometown. I truly believe I learned more in those museums than what I learned in most of my classroom experiences. What was it about the science museum that helped me learn more than my classrooms? Well… I cared about the museum. It was a place that made me happy, and it was a place that brought me a lot of joy. I can’t say the same about school. School was an unhappy place where the girls bullied me and I felt alone. Here is what I propose: incorporating these kinds of informal learning experiences with your classes could bring your students the kind of happy memories I had learning outside of school. There are many ways you can incorporate informal learning in your classroom, and here I’ll provide you with some ways you can do that. My fondest memories learning science at school were from field trips. My most memorable experience was visiting the aquarium in my 7th grade biology class. What holds a lot of schools back from taking a lot of field trips is the cost. Museums and zoos aren’t free, and budgets are tighter than ever. But there are plenty of ways you can get your class outside in a way that can be budget-friendly. Many educational institutions like zoos and museums offer discounts for school groups that reserve in advance. The museum near my hometown has a “fossil fund” that allows schools to make trips at a much cheaper cost. But field trips don’t have to take place in a museum or at a zoo. Explore the neighborhood or even study local environments like streams or ponds to learn more about ecosystems. One year, at a summer STEM camp in rural Oklahoma, we took a group of students to a creek not even a mile away from their town. They had never explored this creek before, but they were able to explore local ecosystems within their own backyard. These kinds of experiences give students positive impressions of science and demonstrate the kinds of practices that real scientists use. Some science and natural history institutions offer “discovery kits” that are loaned out to schools. 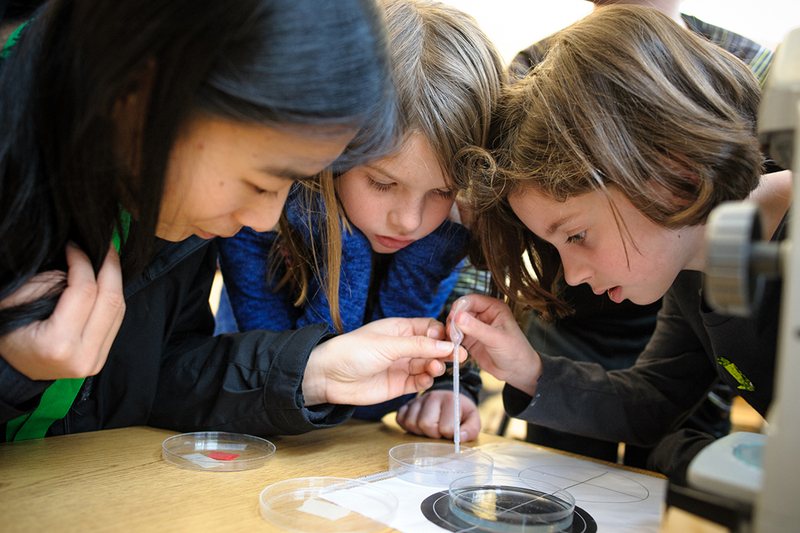 These kits allow your students to handle real artifacts and engage in scientific practices. In the example pictured here, students can handle real rock and mineral samples and learn how to identify them using their characteristics. These kits give your students an opportunity to think and behave like a real scientist and have a memorable experience while they learn. Check out the websites of state museums and other educational institutions to see if they offer discover kits like these. The cost will vary from museum to museum. The discovery kits for my home state museum are offered free of charge to schools in the state thanks to a grant. It’s a great way to bring your students a museum experience without leaving the classroom. Don’t shy away from technology in your classroom–embrace it! There are so many ways you can incorporate technology in science lessons. PHET offers interactive computer simulations you can use to demonstrate scientific processes and concepts. Pocket Lab offers data collection tools and accompanying apps that you can incorporate as a part of data-gathering experiments. There are even ways you can get students to use their own phones and tablets in class. There are hundreds of free and paid apps that you can incorporate into your lessons. Here’s a list of ten science apps you can use in your own classroom. It is important that we incorporate 21st century technology in a 21st century classroom. As we become more and more dependent upon technology in the modern world, it is important that we provide students with opportunities to utilize technology in the classroom. It gives students the opportunity to apply what they have learned and experience what it is like to gather and analyze data in an efficient way. One of the best ways to engage your students is to provide them with hands-on learning experiences. When reflecting on what they have learned throughout the year, your students aren’t going to talk about the lectures or worksheets they had to fill out. Their most memorable experiences are going to be the fun they had during an experiment or activity you provided for them. Hands-on learning doesn’t have to be expensive, and doing hands-on science on a budget is very doable. There are thousands of cheap and easy-to-do experiments and activities that you can share with your class. And of course, you can bookmark our site here for these types of activities. These kinds of experiences are going to leave a lasting impact on your students’ learning. These are just some of the ways you can spice up your classes and provide your students with meaningful experiences. What do you like to do in your science classroom? Leave a comment and share with other teachers!